Praise for CMMI (R) Survival Guide"Traveling down the CMMI road can be difficult and time-consuming. Garcia and Turner have given us a practical roadmap that addresses the key points to learn as well as the many potholes to avoid. Their Survival Guide is a most valuable resource for the journey. It will help immeasurably in achieving the process improvement that you seek." -Dr. Howard Eisner, Distinguished Research Professor, George Washington University"Helps you get to the 'red meat' of the CMMI quickly and with minimum pain. "-Donald J.
Reifer, President, Reifer Consultants, Inc. "The best words I can offer potential readers is that you must have this book, not on your shelf, but with you for repeated reading to glean new ideas or reinforce old ones you gained from the past readings. 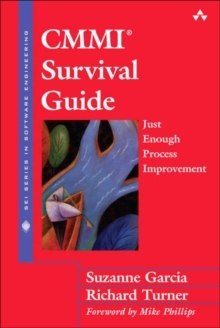 If you have ever been directly involved in a process improvement initiative or if you are starting one, this book can only help you to do a better job. And while [the authors] may not have written this book explicitly for experienced consultants, I found it a great reference even for those of us who helped start this industry, because it provides clear and useful answers to those tough questions we are asked all of the time." -Tim Kasse, CEO and Principal Consultant, Kasse Initiatives LLC"This book contains practical (working) tips for the 'getting started' phase of process improvement, which is the hardest one in the road to improving one's processes." -Agapi Svolou, Principal of Alexanna, LLC, and SEI CMMI Transition Partner "The authors have done an outstanding job in providing guidance for process improvement from a practical perspective. Instead of focusing on a single technique or approach, they have provided a variety of methods for process improvement implementation and have framed their discussion with rich context from lessons learned. The concepts described in this book will be useful to both those starting CMMI implementations and to those who are well into their journey but are still looking for ways to lessen the pain and provide value-added improvements. Reading the book is like being in the audience during a live presentation by SuZ and Rich-they wrote the book as they would present the information to a live audience. "-Bill Craig, Director, Software Engineering Directorate, AMRDEC, RDECOM"I have been involved in process improvement since the early 90's and many of the mistakes that I made could have been prevented if this book had been available then. "-Claude Y.
Laporte, Professor, ETS Universite du Quebec"Primarily, the book is practical. The guidance presented is geared toward someone who is not exactly sure why they need process improvement, but is presented with the fact that they must do it. Very often these are smaller organizations, with limited resources, and uncertain support from above. As I read the book, I thought almost immediately of a couple of organizations with which I am familiar who could use this kind of tutelage. There are real, and useful, techniques in this book that I believe can help these kinds of organizations prioritize and establish reasonable plans for improving the processes in the organization. I also like the sidebars and personal observations. Discussions of experience can really help organizations through the various pitfalls that are part of developing and deploying processes. It makes the book more of a 'real life' guide, and not a theoretical exercise. Finally, the book is an enjoyable read. The conversational style of the book (and the humor) make it much easier to read than many of the books I have read in the past. "-Alexander Stall, Principal Process Improvement Engineer, Systems and Software Consortium The CMMI provides a framework for process improvement spanning the life cycle of a product or service, from conception through delivery and maintenance. Widely and beneficially adopted around the world, the size and apparent complexity of the framework have nonetheless been daunting to some organizations. That need not be so. With a proper guide to help navigate around unknown dangers, potential pitfalls, and false paths, you too, can realize substantial business value from a successful CMMI implementation. This book is such a guide, full of the real-life examples to ease your way, and written in a lighter style to ease your reading. The CMMI (R) Survival Guide is an effective resource for multiple readerships. If you are just now considering a process improvement program, with the CMMI among your options, the authors' discussion of relevant issues will enhance your business case right from the start. If you have already decided to implement the CMMI, the authors' practical knowledge will help you make the most of your efforts. Even if you are well into a CMMI implementation, but are lost, stuck, or going around in circles, the authors' valuable advice will help you regain your direction. If you work in a smaller or resource-strapped organization, you will particularly benefit from the authors' description of alternative paths to process improvement-approaches that are more incremental or agile, and less intensive, than you might imagine for a CMMI implementation. The authors draw on their extensive experience working with diverse organizations, and on the CMMI tools, techniques, and templates developed for those organizations. Whatever your background or need, the CMMI (R) Survival Guide will help you survey the CMMI territory, consult possible road maps, learn from other CMMI explorers, weigh the benefits of hiring a living guide, and even consider whether the trip is right for you.